Welcome to the jam-packed February edition of the Foodie Diary. 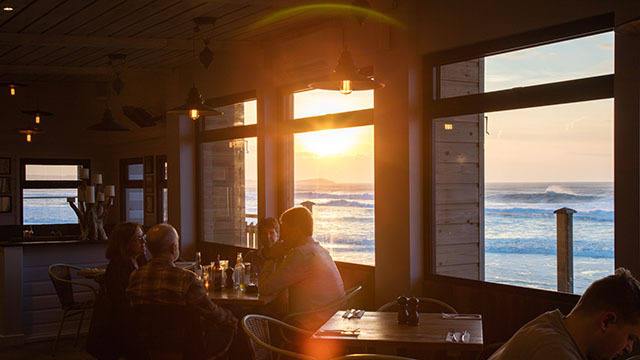 It may be cold and wet (and even snowy) outside, but there’s a lot going on in Cornwall this month, so make the most of our county being quiet, and go and support your local restaurants! Cornwall’s newest festival, Porthilly Spirit, has just been announced, and it will take place over the spring bank holiday weekend at the end of May, at Trefresa Farm near Rock. Organisers are currently putting finishing touches to the programme of talks and workshops, wellbeing and family activities, and the music line-up. In terms of food, think long table, communal feasting with some fantastic chefs at the helm. 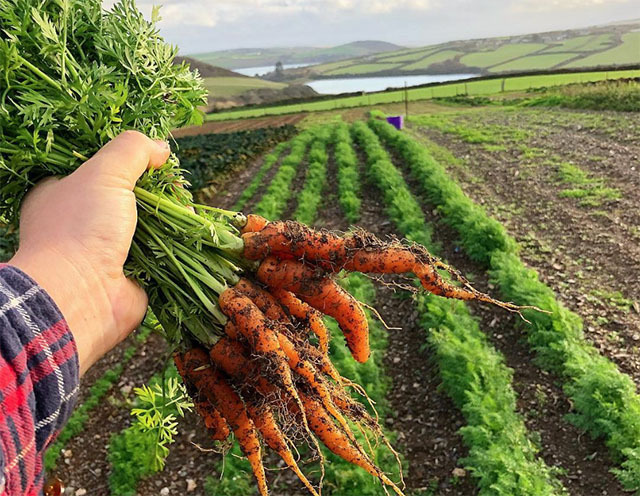 There’ll be guest chef dinners, campfire cooking, a local produce market, pop-up restaurants, gin tasting, foraging workshops, and wild cookery. It sounds fab. Sign up on the website to be notified when tickets go on sale. 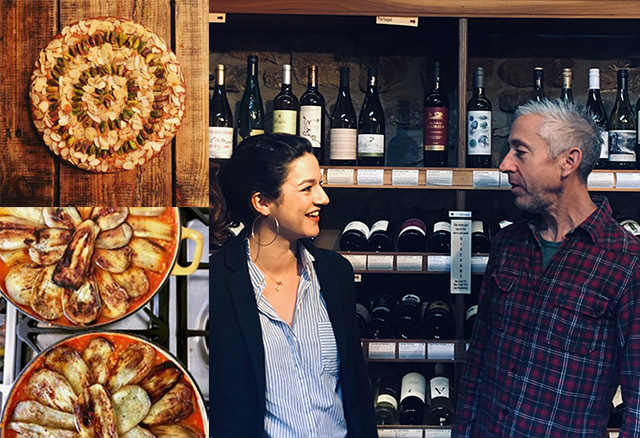 Congratulations to The Longstore in Charlestown, which has just won “Best Wine List” in the Food Reader Awards, which cover the South West, from Gloucestershire down to Cornwall. Tuscan Wine Feast on Thursday 7 February, a collaboration with Italian wine producer BRANCAIA, six courses with matching wines £75pp. Drop in wine tasting, 3pm to 5pm on Saturday 9 February, a chance to try a selection of wines the team has chosen to celebrate Valentine’s Day. “Will you Cheese be my Valenwine” – a cheese fondue with a platter of delicious dippers, available from 6pm to 9pm, Wednesday 13 to Saturday 16 February, £14pp. 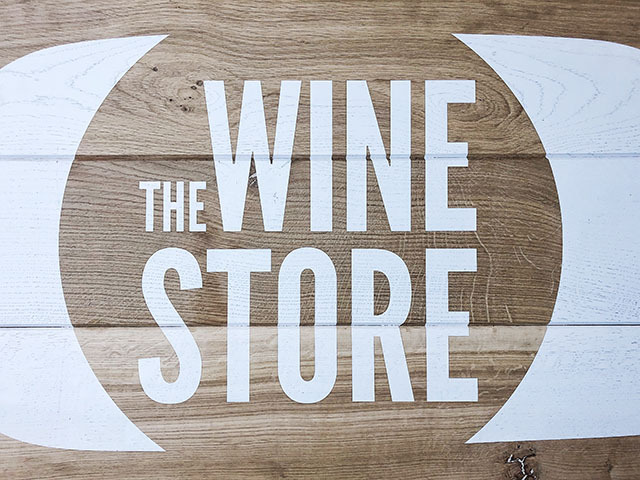 The Winestore also runs a two-for-one deal on small plates between 12pm and 5pm on Saturdays and Sundays, and 5pm and 9pm on Mondays, Tuesdays and Wednesdays. For full details of events, and to book, visit Facebook. If you’ve got some time to unwind on a Thursday, take advantage of Una Kitchen‘s Dip and Dine offer. Enjoy a free swim, and use of the hot tub, sauna and steam room, when you book a table for two (or more) people for lunch or dinner. For full details, to see the menu (which includes delicious wood-fired pizzas, fish and steak) or to book a table, visit www.unastives.co.uk. 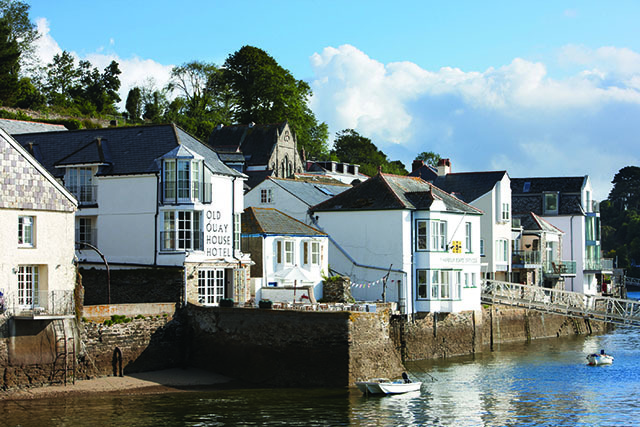 The first ever Fowey Food Week will take place from 2 to 9 March, with global cuisine on offer across the town, giving visitors a chance to “eat your way around the world without leaving Fowey”. Each participating restaurant, pub or café will offer at least one special dish from their chosen country, priced at £10 or £5 depending on the venue. Customers can collect a ‘passport’, getting a stamp for each place they visit. 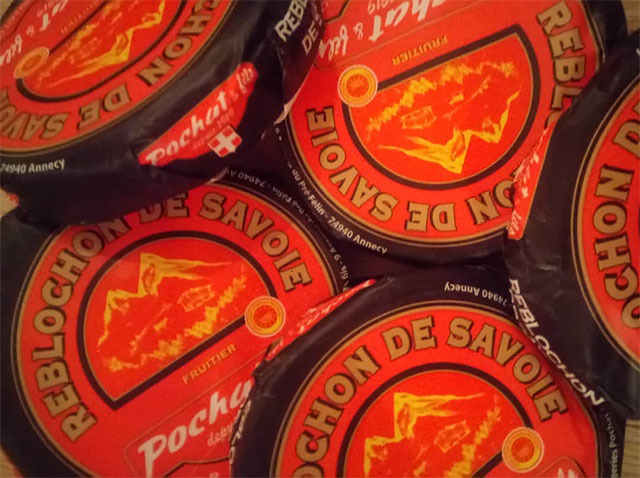 Three or more country stamps across the town over the course of Food Week means they enter into a grand draw to win prizes at the end of the week (donated by participating venues). Confirmed venues (and the countries they will represent) include Fowey Hall (Thailand), The King of Prussia (Mexico), The Old Quay House (South Africa), Pinky Murphy’s (Cyprus), Pintxo (Spain), Readymoney Beach Shop (Croatia), and Sam’s (France). There will also be tastings, demonstrations and talks, together with the Fowey Pasty Championships and The Great Fowey Bake Off. The dates have been released for Nancarrow Farm’s first two workshops in their brand new Butchery and Larder. On Saturday 9 March Steve Lamb from River Cottage will be running a “Curing and Smoking” workshop where participants will learn to make a range of cured and smoked products such as bacon, pancetta, bresaola, prosciutto, guanciale, lardo, salami and pastrami as well as hot and cold smoking techniques for fish, poultry and game. 9.30am-4.30pm, Saturday 9 March, £150pp (limited to 8 people), includes lunch and refreshments. For full details see here. On Saturday 16 March Nancarrow’s own Jack Bristow will be teaching all things pig, in a “Pigs, Pork and Preserving” nose-to-tail workshop. 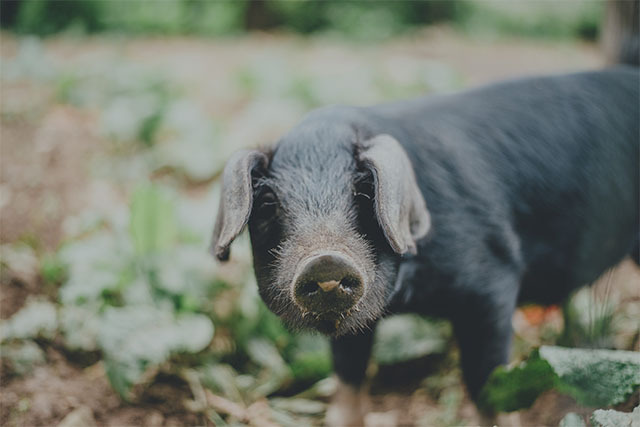 Over the course of the day, you will learn about different breeds of pig, and how to raise them. In the practical sessions, you will learn how to butcher a pig into the various different cuts and use every part of the animal. You’ll make sausages and bacon as well which you will take home with you along with some pork chops. 10am – 4.30pm, Saturday 16 March, £150pp, includes lunch and refreshments. Full details here. 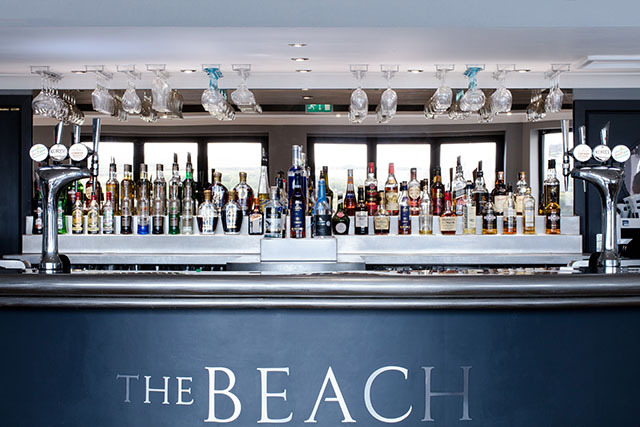 The Beach at Bude‘s first wine tasting dinner of 2019 will be held on Friday 1 March. New head chef Jamie Coleman will be joined by a guest chef, and the pair will be cooking a five course feast, with a matching wine flight. Dinner, bed and breakfast options available. Call 01288 389800 to book. 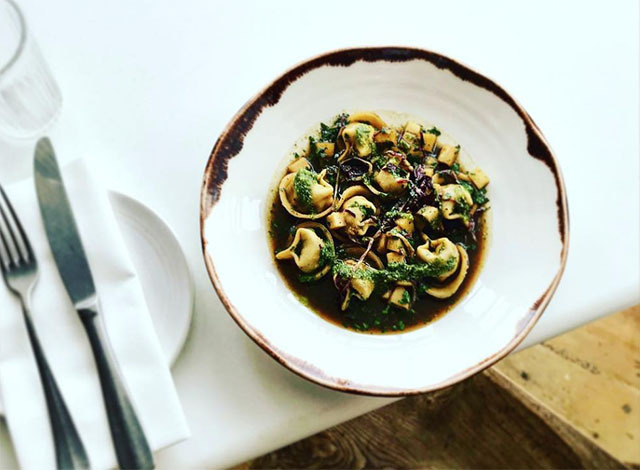 We’ve heard great things about The Old Custom House in St Ives, which was opened in August last year by chef patron Stephen Knowles and Haley Sugden. The mouthwatering Italian-inspired menu consists of small plates (see sample menu) and there are also set menus, with five small plates for £21 (vegetarian options available). The restaurant is open for supper from 6pm Tuesday to Saturday. Lunch is served from 12pm on Fridays and Saturdays, with regular pasta and wine £10 lunch deals. Keep an eye on their Instagram feed for the daily specials. You can also pop in for cheese, charcuterie and wine between 3pm and 5pm, Tuesday to Saturday. Booking advised, phone 01736 799943 or email [email protected]. St Michaels Resort in Falmouth has recently launched a new menu in its Garden Kitchen restaurant, which offers all-day casual dining. Health and wellbeing are at the heart of the new Mediterranean-influenced menu; there is a range of smoothies and cold-pressed juices alongside a selection of delicious salads, quiches, and stone-baked pizzas, as well as a selection of cakes and other treats for a little indulgence. Open for brunch every day except Sunday (think dukkah scrambled eggs or crumpets with duck egg and confit duck) and lunch each day (try the sharing boards and big bowls of salad, with the crispy potato skins on the side), as well as supper on Friday, Saturday and Sunday evenings, when there are also small plates on offer (e.g. courgette and polenta chips with Nigella seeds and tahini yogurt, and charred baby gem with anchovy, smoked bacon and pangrattato). See the menu, and for more information visit website. *Read our new review here. Katy Davidson, a.k.a. 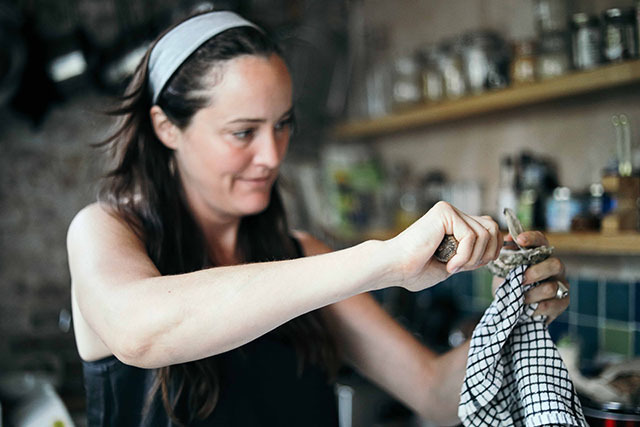 The Oyster Lady, is offering a Shellfish Skills experience from her home in Newquay. Katy will take guests to Newquay Harbour, to collect lobsters and crabs direct from the fishermen. Returning to Katy’s house, guests will learn how to cook and prepare a lobster and a crab each, which can be eaten then and there, accompanied by some crisp dry white wine, or taken home to be enjoyed later. £95pp, available on Thursday afternoons, for full details or to book a place see here. 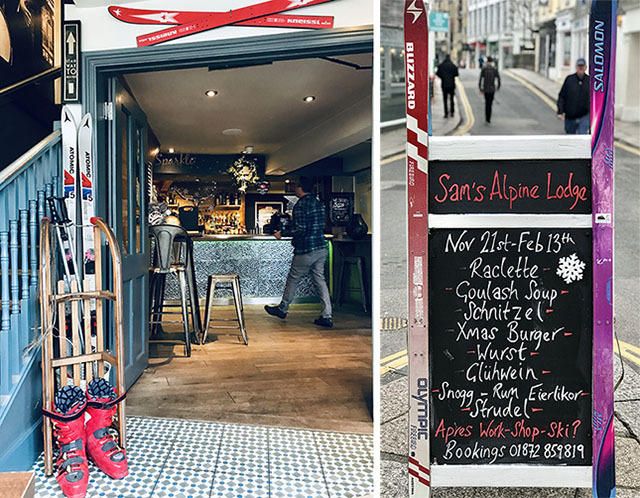 Sam’s in the City continues to run its Alpine Lodge until 14 February, when the “season” ends with an après-ski party, fancy dress optional. The alpine-themed menu includes a delicious raclette with all the trimmings, as well as schnitzels and Toblerone cheesecake. Bookings advisable, phone 01872 859819. 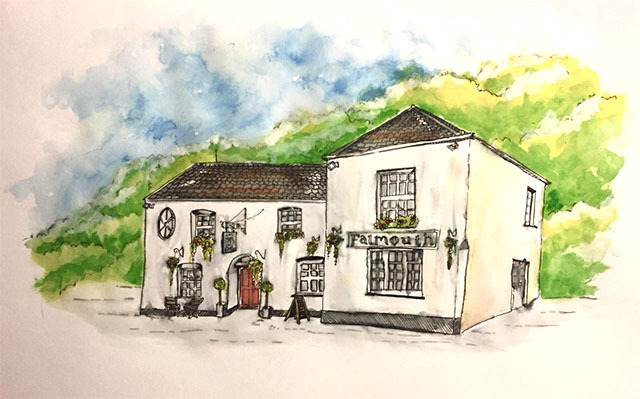 Chef Kevin Viner has taken over The Falmouth Arms in Ladock, offering fine dining in a cosy setting, and accommodation in four newly-decorated bedrooms. Kevin held a Michelin star at his restaurant, Pennypots, from 1993 to 2000. For more information, to see a menu, or to make a reservation, visit www.falmoutharms.com. You can also keep up to date with news via Facebook or Instagram. Currently there’s a Valentine’s break available – one night’s dinner, bed and breakfast, including a three course dinner, from £165 for two people sharing. 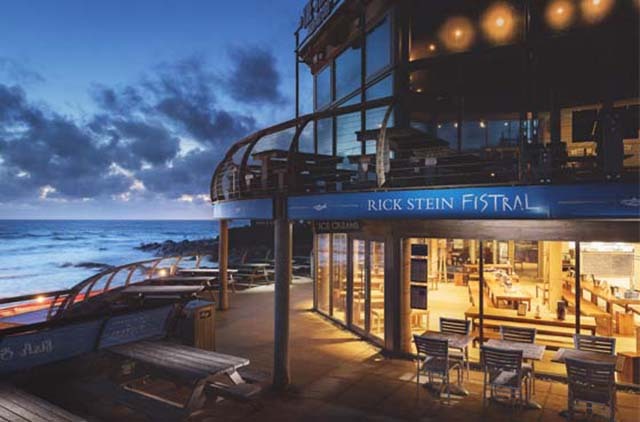 Save £5 when you spend £20 at Rick Stein, Fistral. Download the voucher here. Perfect for a bowl of warming curry, or classic fish and chips, after a blustery walk along the beach. Kids eat for £1 for a main course from the Mini Stein menu (or £3 for three courses) with every adult main course at Rick Stein’s Fish in Falmouth. Available at lunch and early dinner (between 5pm and 6pm) until 28 February, including half term. For full details see here. The Cornish Arms in St Merryn is offering Rick’s classic fish and chips, with tartare sauce and mushy peas, for £9.95. Available at lunchtime, Mondays to Thursdays, until 28 February (excluding school holidays). See website. Rupert is also holding a Valentine’s supper on 14 February, with a lovely looking five course menu, priced at £40pp. Booking essential. For full details of all courses and events, visit website. 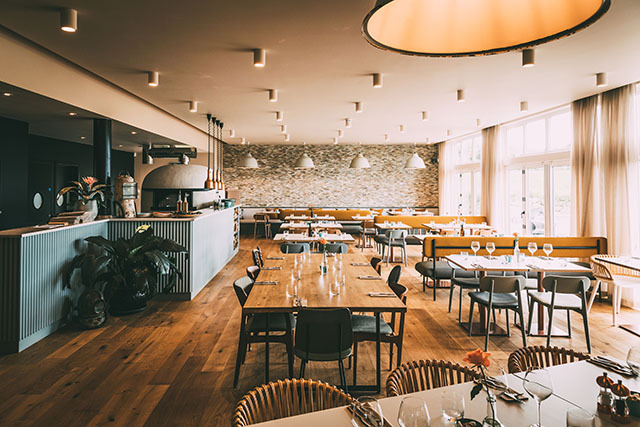 Fifteen Cornwall has a brand new menu for 2019, which is now available at both lunch and dinner. The menu includes old favourites as well as innovative new dishes created by head chef Adam Banks and his team. The Italian inspired dishes, with a Cornish twist, on the sample winter menu include taglierini with Looe day-boat squid and pangrattato, clementine, burrata, radicchio and nutty buckwheat, risotto with red wine, creamy Italian Robiola, walnuts and crispy rosemary, and Josper-grilled Cornish lamb with kale, lentils and salsa verde. At lunchtime, diners can choose two courses for £22, or three courses for £27. Available every day until 5 April, with the spring menu available from 4 March. For more details or to book a table see here. 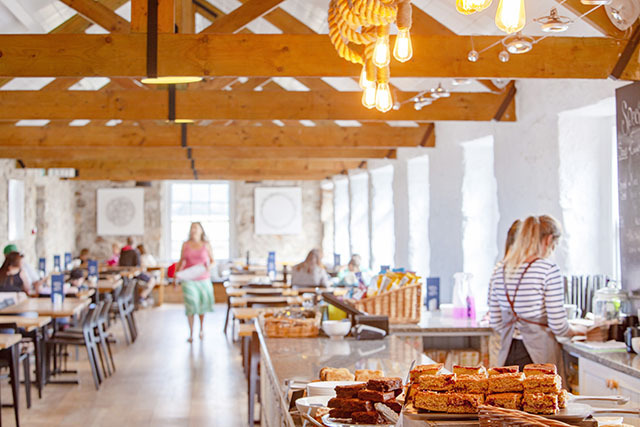 Recently opened near Launceston, Tre, Pol & Pen is a smart new café and farm shop, which comprises a deli and butcher’s counter, as well as selling fruit and veg, fresh bread and pastries, groceries, and beautiful homewares. The café is open daily and serves breakfast (8am to 11am), lunch (11.30am to 2.30pm) and afternoon tea (2.30pm to 4pm). Food is all freshly made to order; there’s even a stone baked pizza oven. Upcoming workshops include pottery and flower arranging, and there’s a spring market planned for 31 March. For more information visit trepolandpen.co.uk. A vegetarian feast inspired by flavours from the Middle East. From 6pm. £30 pp. Phone 01288 354739 to book. Kate will be cooking a three course winter-blues-busting meal in the cosy Emily’s in Truro. A bargain at £15, and half price for children, who are very much welcome. Two sittings, 6pm and 8.15pm. Full details on Instagram. Travel cookbook writer and chef Jon Lewin joins Neil Haydock to cook a feast of authentic Sri Lankan curry dishes at The Beach Hut at Watergate Bay. There will also be live music and a beach bonfire. £30pp, book online. Beautiful & The Feast and Origin are collaborating for this seasonal feast at Origin’s coffee shop, The Warehouse, in Penryn. Tickets are priced at £26.79, for full details and to buy a ticket, see here. Join Ben Quinn for an everyday Middle Eastern cookery lesson, 2-6pm, £50pp. Join chef-turned-grower Ross Geach in his polytunnel for a 5 course winter feast featuring homegrown pork, cauliflower, kalettes and carrots, most of which will be cooked on the Big Green Egg. £30pp, BYO drinks, wine also available to buy from binTwo. In partnership with Cornish Gems, The Coffee Lounge in St Ives is raising money for Cornwall Air Ambulance. Please donate your unwanted Christmas gifts and go along to the coffee morning and donate a fair price for items you want! The fabulous Helping Hands and Pans (members of Rick Stein’s team who dontate their time for charitable events) are cooking to raise funds for Age UK at this dinner in Newquay. The tasty sounding menu is £27.74pp, book online. 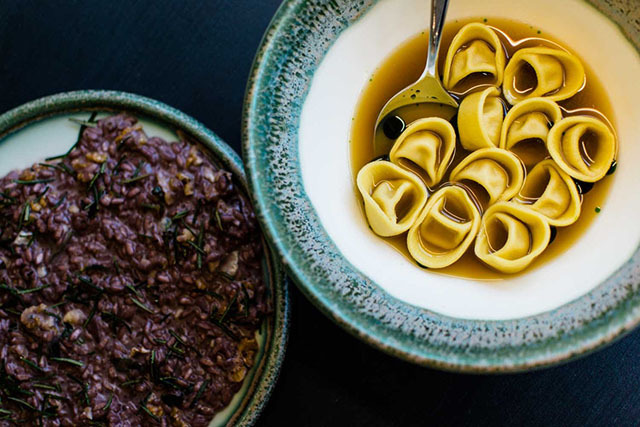 This special winemaker dinner celebrates all things Tuscan with a feasting menu created by executive chef Ben Ambridge in collaboration with Italian wine producer Brancaia. Diners will be guided through each wine and hear stories of wine making in Tuscany. Booking essential. £75pp. Phone 01726 68598. An evening of Tinkture gin cocktails, Chocolarder chocolate and truffles, and canapés from Nancarrow Farm. £10pp, buy tickets online. 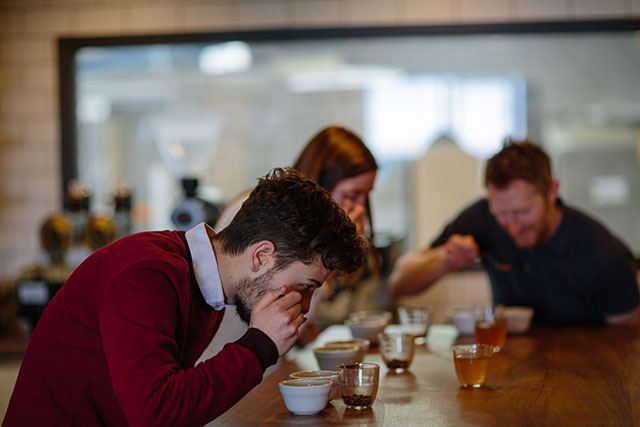 Origin’s Jesse Dodkins will be hosting a coffee cupping with the team at 108 Coffee House in Truro. Jesse will teach the method and principles behind cupping, and those attending will be able to sample various coffees. Free entry, open to all. For full details see Facebook. A wine dinner with a twist, at Trevisker’s Kitchen near Padstow, with new in-house wine expert Tamsin Jones. Guests will be given tasting notes and will have to work out which wine they are drinking with each course. There’ll be a prize for the best answers. £35pp for 7 courses, £25pp for the wine flight. Origin cofffee roasters host their first Latte Art Throwdown of the year, at their Warehouse location in Penryn. £5 to enter, free for spectators, with music, complimentary beer and pizza throughout the evening. For more info or to enter, see here. Darren Broom returns for his second Temple Takeover where he will be serving a Scandinavian influenced menu cooked over fire and hot coals. The traditional techniques will be complemented with modern dishes and intense seasonal flavours. £40 per person. Booking essential. See here. Authentic tartiflette (made with potatoes, Reblochon cheese, lardons and onions) at French café Choukette in Newquay. £20 for adults, £15 for children, includes main dish, dessert and a hot drink. BYO wine. Booking essential. A “build your own, eat with your hands, pass and share kind of feast” accompanied by the sounds of a visiting mariachi band, and a beach bonfire. £35pp, book online. An Indian and Sri Lankan curry buffet with a glass of Knightor’s Kerner wine, with an optional pre-dinner wine tasting. £22.95pp for the buffet, £28pp including the wine tasting. Book online. 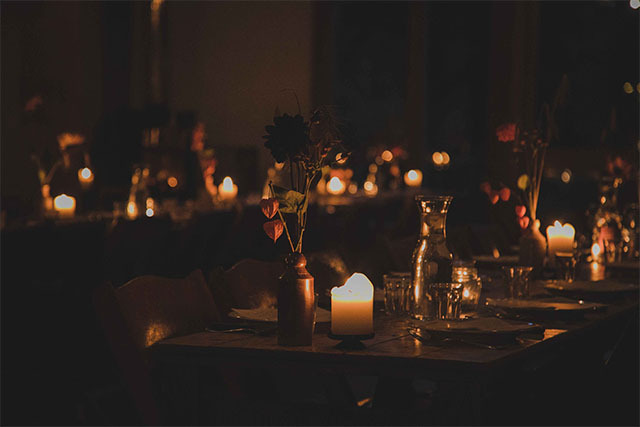 Nancarrow’s February Feast features whole hogget and wild garlic, and as with all Nancarrow events, you can guarantee delicious food and a magical atmosphere. Tickets are priced at £40pp, with a dinner, bed and breakfast package available for £200 for two people. 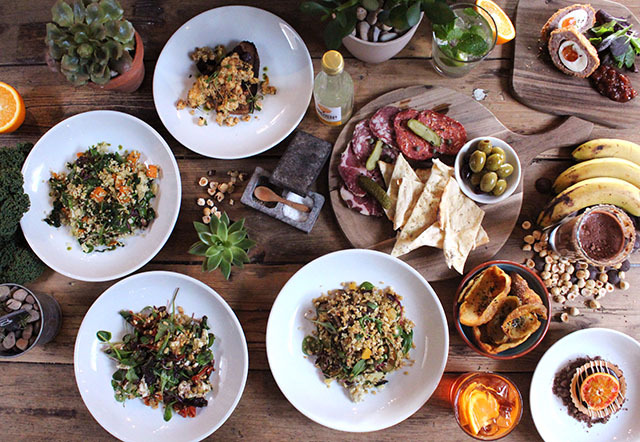 Sasparella is joining Espressini for an evening of special vegan feasting, Middle Eastern style. Expect delicious plant-based small plates with plenty of flavour and thoughtful touches. 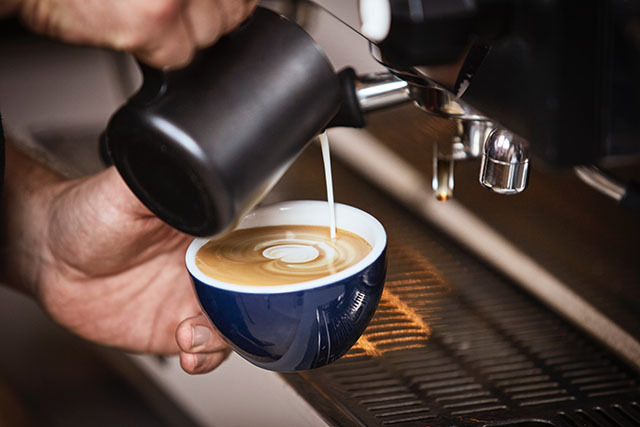 The Espressini bar will be open with vegan beer and wine on offer. £27pp, see Facebook for more details. The Sail Loft restaurant on St Michael’s Mount will be open from 10.30am to 4pm from 17 to 22 February. Head chef and keen forager Greg Milne sources local and seasonal Cornish produce, creating light lunches, homemade bakes and daily specials. Access to the Mount is via the causeway at low tide or by boat at other times or when the causeway is closed. 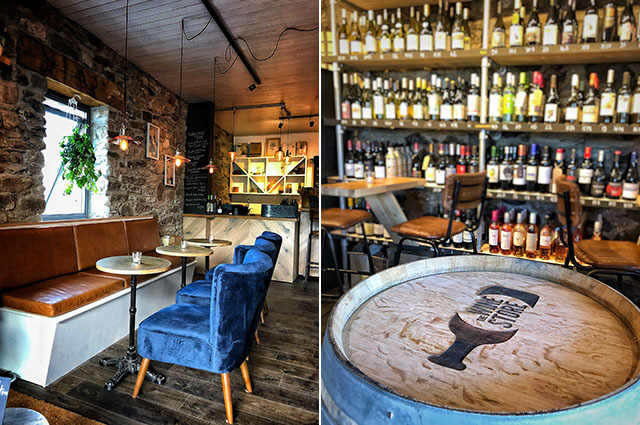 South Western Distillery will be visiting binTwo in Padstow for a special cocktail evening, demo-ing five cocktail recipes (with tasters). 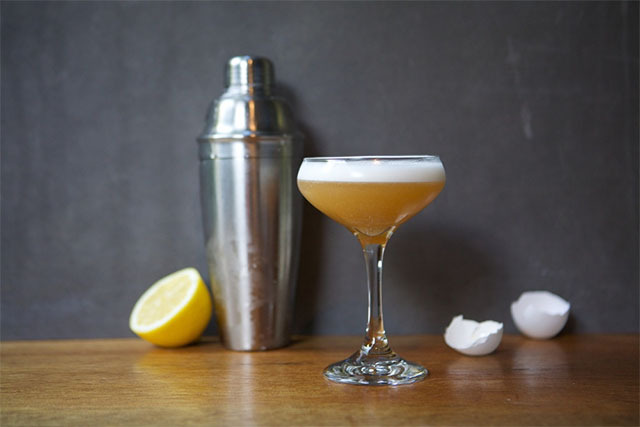 Two cocktails are also included in the price of £25pp, further drinks available to buy from the bar. Only 18 tickets available, book online. Another corker of an evening at The Beach. Expect delicious food and fine wine to match. £65pp. Big flavours at big tables for Kate Attlee’s Middle Eastern supper club, with matching wines by Scarlet Wines’ Jon Keast. £50pp for three courses and wines. A special dinner with live music, dancing, charity auction and raffle in aid of Mind and Little Minds, a new charity set up by Hannah Evans to help children with mental health issues. £35pp, phone 07890 959847 or email [email protected] to book your tickets. 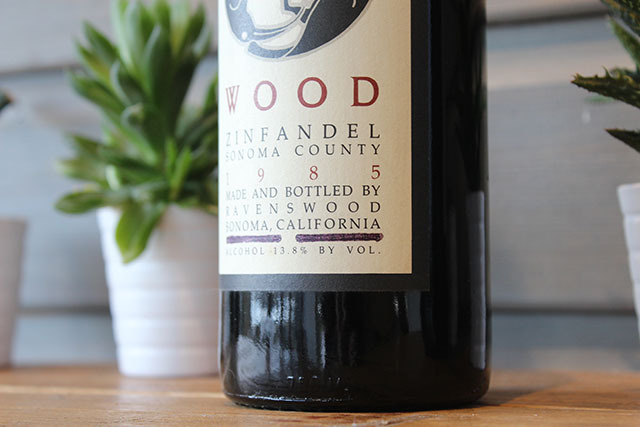 A new series of collaborative wine suppers by Buchanan Wines Cornwall kicks off at St Kew Farm Shop with Californian wines from Ravenswood. The wines will all be available by the glass, paired with rich sticky smoky savoury food, served at one table, feast style. Professional and amateur pasty bakers are invited to enter this year’s World Pasty Championships at The Eden Project. For entry forms and more information visit website. Author and chef Skye McAlpine is visiting Hotel Tresanton for a four course Venetian dinner, after which there’ll be a Q&A and book signing. £65pp for dinner and drinks. For more details or to book, visit website. Authentic Spanish tapas dishes, made using local produce, £22.95pp, book online. 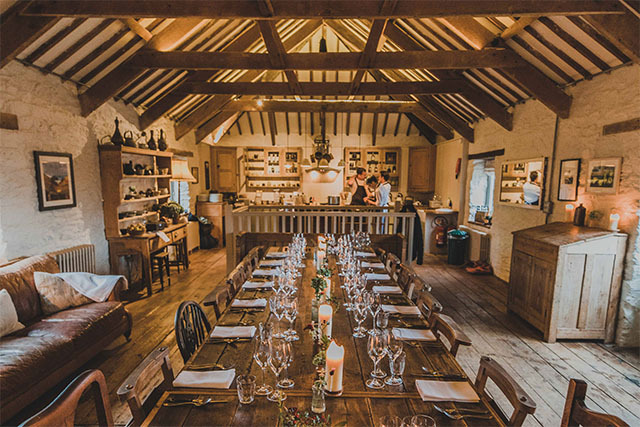 The first Farm Dinner, a new style event at Nancarrow Farm, is a four course dinner for just 20 guests, who will be seated around the beautiful kitchen table in The Old Mill. £65pp, with dinner, bed & breakfast packages available too. For full details or to book a ticket see website. We’re very happy that we can now reveal that Paul Ainsworth will be taking over The Mariners in Rock this spring. We can’t wait to see the menu! The new Saturday brunch menu at The Longstore in Charlestown is well worth a try. We selflessly spent a morning working our way through the delicious menu. Find out more. The team behind The Bear Bars in Truro and St Agnes are taking over The Ship Inn in Wadebridge. They are currently recruiting for staff. See their Facebook page for recruitment details and further information. Congratulations to Emily Scott and her team at St Tudy Inn, which was positioned at No 24 in the UK Top 50 Gastropubs awards this week. St Tudy Inn is the only Cornish pub to be listed, with The Cornish Arms, just over the border in Tavistock, coming in at No 18. Padstow Food Fair will be held in the Padstow Memorial Hall from 10am to 4pm on the following dates in February: 9, 10, 11, 12, 17, 18, 19, 23, 24, 25 and 26. The team behind the Padstow events will also be starting a monthly food market in Wadebridge from March. Keep an eye out for Cornish Moo‘s new vending machines, which will be selling their fresh, whole, pasteurised milk. This innovative business looks set to change the way we buy milk. Between 14 February and 7 March, Hotel Endsleigh (Dartmoor) will be undergoing a refurb, and during this time the food offering will be simplified, but it sounds really lovely. A buffet style breakfast will be served in the main house, a simple light lunch menu will be served in the library, and a three course set menu will be served in the stables in the evenings, on one long table in the style of a dinner party, with twinkling lights and a fire pit. The hotel is offering a 40% discount on room rates during this time. To take advantage of the offer, see here. Sam’s in the City in Truro has a great winter deal, with two-for-one on fish and chips, and meat or veggie nachos, between 3pm and 6pm, Monday to Thursday. Ideal for a late lunch or an after school kids’ supper. To book a table phone 01872 859819. The Driftwood Hotel is offering three nights for the price of two until 31 March (excluding 14 February). From £600 for three nights, based on two sharing a double room, including a 5 course tasting menu on your first night in the hotel’s Michelin-starred restaurant, and a 3 course menu on your third night. 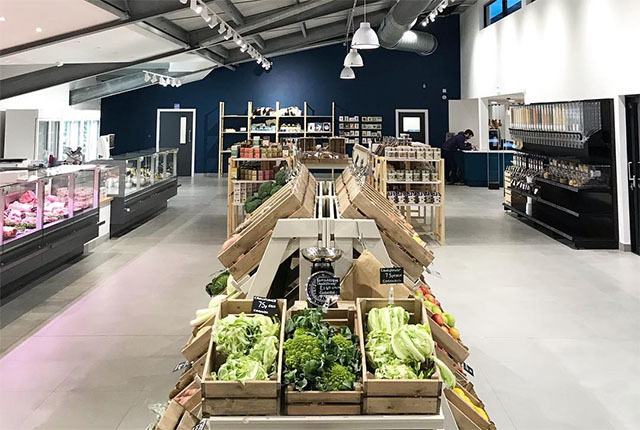 A new plastic-free refill store will be opening at Hawksfield, near Wadebridge, this spring. Replenish will stock a range of food and household goods which you can fill your own containers with, as well as eco-friendly products. 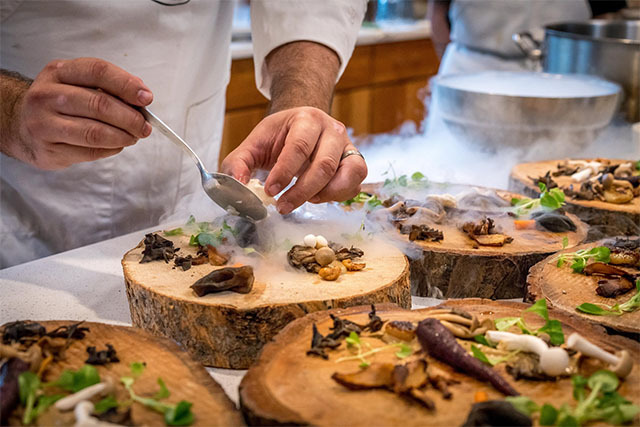 28 January saw over a hundred chefs and members of the hospitality profession gather at Fifteen Cornwall for the first Chefs’ Forum event of the year. Guests were treated to canapés made by the apprentices and catering students from across the county, followed by talks and demos, including Adam Banks making crab tortellini, Gavin Roberts’ sausage-making demo, and talks on sustainable fishing and plastic reduction. We love to hear from you. If you have news for the March Foodie Diary, please send by email by Monday 25 February.